The greatest day of a sanctuary cat's life is the day it is chosen by a family and given a second chance of a happy life. 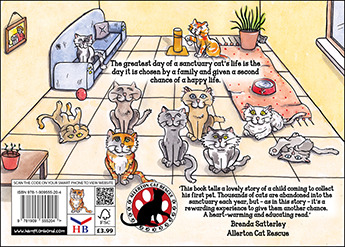 "This book tells a lovely story of a child coming to collect his first pet. Thousands of cats are abandoned into the sanctuary each year, but - as in this story - it's a rewarding experience to give them another chance. A heart-warming educating read." Brenda Satterley, Allerton Cat Rescue. 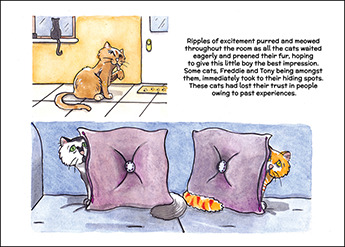 Anyone who likes cats is going to love this book! 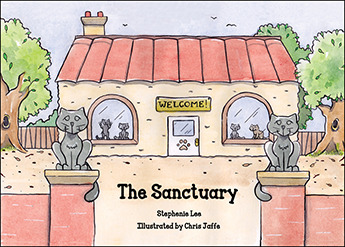 Stephenie Lee tells an enchanting tale that pulls at the heart strings. Children are reading this book again and again, and critics themselves are looking forward to a next in the series. Superb watercolour illustrations by the well-known Chris Jaffe bring this book to life. His remarkable talent is evident from the outset and only reaffirmed when children and parents are brought to laughter by his exquisite depictions. The Sanctuary is a book like no other and its vast popularity amongst children is simple proof of its significant value.